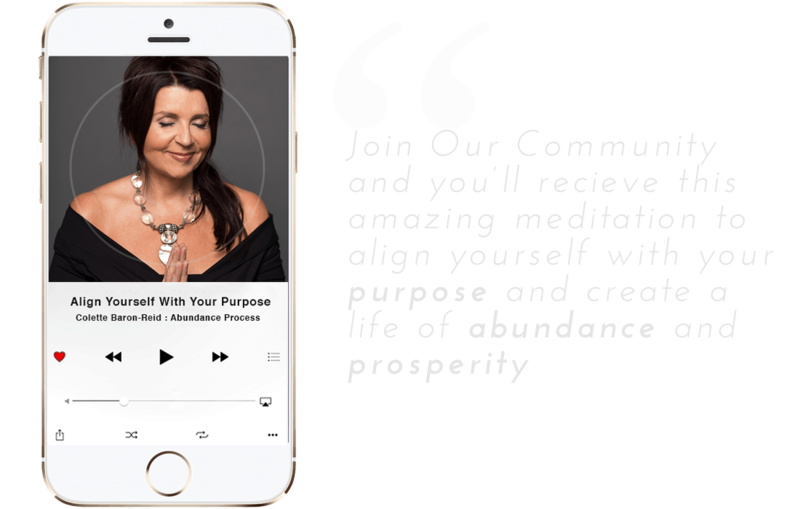 Colette Baron-Reid , is an internationally acclaimed, Oracle expert, thought leader, and number one best selling author of “The Map”, other books, and products (including Oracle Cards and Meditation Apps). As a spiritual medium, she is also the star of the hit TV series, “Messages from Spirit” (Amazon Prime/YouTube), and she hosts the highly popular call-in radio show “Ask the Oracle” on HayHouseRadio.com. She is a celebrated author, published in 27 languages, and a spiritual teacher. Her fans lovingly call her “The Oracle Queen.” Seen and heard on talk shows across the nation, her guest appearances include Dr. Oz, Dr. Phil, Oprah and Friends radio, and The Today Show. Her best selling and most loved products are her beautiful Oracle Cards, derived from ancient spiritual traditions, which she has created to communicate in a modern language for the contemporary spiritual seeker. “Oracle cards are the key to open your connection to the Universe”™! She is the founder and creator of Oracle School- a global online learning experience about how to use oracles to manifest an empowered, inspired magical life. Also, she is the creator of The Invision Process®, an in-depth transformational meditation process that retrains the subconscious mind to release unhelpful habits and beliefs, allowing you to pursue all types of goals—from losing weight to leading a new project at work—with greater confidence and success. With over 30 years of experience and a global audience in 29 countries, Colette’s greatest joy is teaching people that they can have a direct and personal dialog with the Universe to help them create their best lives. Colette splits her time between the USA and Canada with her husband and two adorable Pomeranians. When she’s not creating oracle card decks and teaching global audiences, she’s writing songs, singing and recording music to chill to. I have many titles: oracle, medium, spiritual adviser, TV host, bestselling author, recording artist, entrepreneur, motorcycle enthusiast, wife, and (perhaps most importantly) dog mama to three Pomeranians, my beloved furry companions. I have worked as a professional intuitive for over 30 years, providing guidance for over 50,000 people who have sought me out from 29 different countries. I’ve been blessed with invitations to host my own radio and TV programs and to appear on shows like Dr. Phil, Oprah & Friends, The Today Show, and many others. My journey from rock bottom… to right here & now. So how did I get “here”? Well, like most human beings, my life has been strewn with many gifts and opportunities—along with many challenges. I’ve had my heart broken. I’ve felt piercing regret, isolation and shame. I’ve wondered if I would ever find “The One” or if I would feel lonely forever. I’ve wondered if I should go on living. I have felt the strangulating grip of addiction—to food, to drugs, diet pills, alcohol, you name it. At my very lowest point—demoralized, bankrupt in every way, staring at my reflection in the mirror in my drug dealer’s bathroom—I cried out to Spirit for guidance. (It wasn’t a particularly subtle moment. I literally called out, “Help me!”). Immediately, I felt encased in a halo of light. I could see the light encircling my body in the mirror. It was a breakthrough moment for me—my intuition, which had been so blocked and clouded by my various addictions, returned to me. I knew that everything was about to change. I never set foot in the dealer’s house again. I placed my life in the care of my High Power. I got sober (30 years and counting). I began to embrace my intuitive gifts. Word spread about my abilities and people began calling, seeking guidance, courage, hope, and clarity. My career as an Oracle was born. And here we are… today. Whatever brought you to my website today, I’m glad you made it here. Maybe you will relax and explore this site for the next hour or so. Maybe you will visit every week for the next year or more. Maybe this will be your one and only visit (that’s fine, too!). You are here for a reason. You are loved. When you need to be heard, Spirit is listening. In good times, in desperate times, when things feel foggy, frightening, confusing, strange, and uncharted, Spirit always wants to have a conversation with you. When you ask for guidance, Spirit will provide it. I hope that this website—and all of the writings, recordings, courses, and other offerings here—inspire you to keep asking questions and listening for Spirit’s reply. 2 episodes; one with John Edward and the other with Glynis McCants and Dougall Fraser. Prior to Colette’s ascension into the world of self-empowerment and spiritual leadership, Colette had a career in music. You can sometimes catch her singing live at select events.